A male child aged 10 months was brought in my clinic with a cystic swelling near right upper eyelid diagnosed as Chalazion by ophthalmologist. 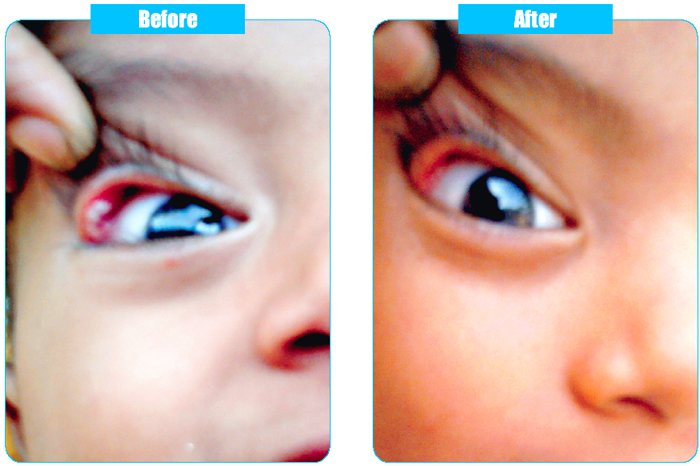 Initially the child had a small cystic swelling on right upper eyelid. There was no trouble except swelling & redness, So it has been mistaken for stye, by parents, but later it bursted out on conjunctiva surface, with granulation tissue protruding. The ophthalmic surgeon advised surgical excision to be the only mode of treatment. As the child is very young and surgery required general anasthesia, parents opted Homoeopathic treatment. He was normally delivered & first child. He was healthy all along until this condition arrived. · Sweat : Moderate, only during sleep. · Mind : The child is very obstinate with shouting. ·One new tiny cystic swelling appeared adjesent to previous site. Sac lac for 15 days. ·Child attained 14 months of age, yet milestones of walking & talking are not appeared. This case shows great advantage of homoeopathic treatment in dealing with diseases of all kinds of children. Here totality of symptoms reflected the constitution of child and the suitable dynamic remedy Silicea revitalized the life force to normal and Nat Mur cleared up the case, the best way of management of health in children.